Sudan's president has been charged with genocide—so why aren't African nations confronting him? On a hot afternoon this past May, I accompanied a small caravan of international diplomats to the tiny Ugandan village of Abia, set in the heart of the country’s rural north about an hour’s drive from the nearest town. For the better part of the past two decades, much of this area was in the throes of a now-defunct insurgency that pitted the country’s government against a group called the Lord’s Resistance Army. Within the annals of Central African rebel movements, the LRA—with its penchant for child soldiering, civilian massacres, and grotesque mutilations—stands out amid an exceptionally brutal cohort. While the LRA migrated out of northern Uganda a few years ago—to the horror of civilians in eastern Congo, the Central African Republic, and Sudan—the fact of the group’s ongoing existence still hangs over Uganda’s slowly recovering north. The Bashir in question was, of course, Omar Al Bashir, the Sudanese president who is wanted by the ICC. To those unfamiliar with Central African politics, the reason behind the old man’s preoccupation with Bashir—who has been charged by the court for crimes committed in Darfur, a long way from northern Uganda—may not be obvious. But beginning in the 1990s, Bashir sponsored the LRA in retaliation for Uganda’s support of southern Sudanese rebels. The victims of the LRA are well aware of the identity of the group’s state sponsor—which explains why so many of Abia’s residents broke into wild applause when the old man offered his query. If any state were going to unconditionally back the ICC in its campaign to arrest Bashir, one would assume that it should have been Uganda. Not only has Bashir contributed to the decimation of the country’s north, but, back in 2003, Uganda became the first country to refer a case to the court—a referral that eventually led to arrest warrants against the LRA’s leaders. The equivocating only got worse from there. A few days into the ICC conference, Uganda’s autocratic president, Yoweri Museveni, released a statement assuring the court that Bashir had not been invited to attend the forthcoming A.U. summit. Sudan countered by urging the African Union to move the summit to another locale—causing the Ugandan government to change its position again and declare that Bashir was welcome at the A.U. summit after all. The low-point of this whole episode came when high-ranking officials at the ICC found themselves beseeching the Ugandan government—the hosts of their conference!—to affirm that the country was, in fact, still a party to the court. In the end, Bashir did not come to last week’s A.U. summit. But, at the summit, the African Union urged the United Nations to temporarily lift the arrest warrants against the Sudanese leader. That development, along with Uganda’s initial equivocating on whether to invite him and Bashir’s rather brazen recent trip to neighboring Chad, gives a sense of the central problem currently facing the ICC in Africa: When it comes to Bashir, politics is utterly trumping justice. Part of the reason is that some African leaders seem reluctant to argue for the arrest of other African heads of state—even ones with whom they have clashed—since it is always possible that, under such a precedent, those who have committed human rights abuses themselves could be next. But Uganda may also be reluctant to take a hard line toward Bashir because it fears a return to armed conflict. If Uganda had announced its intent to arrest Bashir, says researcher and journalist Angelo Izama, it would be “a declaration of war, basically.” Explains Izama, whose Kampala-based think tank studies regional security in Central Africa, “It’s an open secret in intelligence circles that Khartoum is supporting the LRA, is keeping the LRA on a leash, largely as a bargain chip with the Ugandans and the Southern Sudanese.” Along the same lines, two days after the close of the ICC conference, the Ugandan military held a press briefing in which it confirmed what the Kampala rumor-mill had been buzzing about throughout the conference: that a Sudanese militia, possibly one affiliated with the janjaweed, had attacked and killed several Ugandan troops stationed in the Central African Republic. The reasons are unclear, although some speculate that the attack was a warning shot from Khartoum in advance of the conference—a reminder that Khartoum has proxies at its disposal, and is willing to use them against neighboring states. None of this is to say that the ICC was wrong to pursue Bashir. On the contrary, the arrest warrants—first for war crimes and crimes against humanity, and more recently for genocide—were a welcome moral statement. It does, however, point to the limits of what the ICC can accomplish. 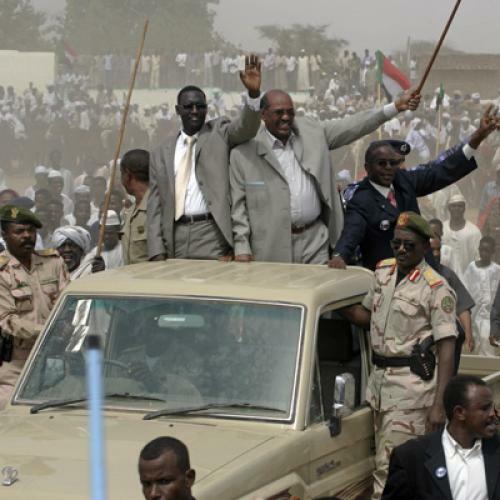 There may have been an expectation, at least in the West, that the court could serve as a tool of conflict management in Sudan, perhaps by somehow constraining Bashir. But the geopolitics of the region have proven to be stronger than the intervention of the court, and these geopolitics remain much the same as they always were. The countries that border Sudan continue to live in fear of Bashir, and must make their calculations accordingly. And Bashir? He doesn’t seem chastened or constrained in the least. Elizabeth Palchik Allen is a freelance writer living in Washington, D.C.